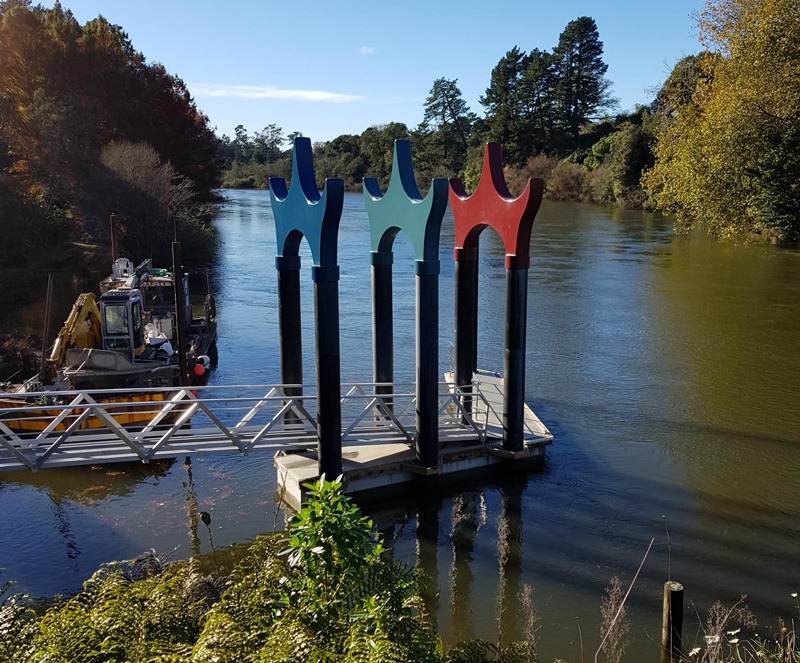 Two new jetties on the Waikato River will connect Hamilton Gardens to the central city. The new jetty at Hamilton Gardens is already in operation after opening on Queen’s Birthday Weekend, while planning has begun for a new jetty below Waikato Museum. The fluctuations of the river level – up to four metres at different times of the year – has created a unique design and build challenge for both jetty projects. The level of the river is controlled by Mighty River Power, which operates numerous hydro‐electric dams. Hamilton Gardens Business Development Manager Tamsin Webb says it’s been fascinating watching the new jetty take shape. “This has been a complex and challenging build, with different contractors working on land and on the River.” A crane was used to drive in piles for the jetty, which features unique shaped fittings atop piles. The project has also included a new ramp to the riverside to improve access to the jetty, all of which forms a more welcoming entrance in to Hamilton Gardens from the river. A few kilometres to the north, the existing jetty below Waikato Museum will be replaced in summer. The Council has allocated $550,000 to the new central city jetty, says Key Projects Programme Manager Natasha Ryan. “The two new jetties offer us a transformational opportunity – there will now be a defined river‐based connection between the central city and the city’s leading tourist attraction. “The river is the region’s defining geographical feature and this is a great way to make use of that,” she says. At present, work is underway on the design of the second jetty and obtaining the relevant consents. That part of the project requires the Council to obtain some independent expert advice. For more information on the Waikato River Explorer and departure times, please visit their website.